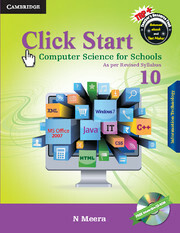 Click Start: Computer Science for Schools, for classes 9 and 10 are the two additional levels in the Click Start series. These books have been prepared keeping in mind the rising demand for Computer Science education in schools. 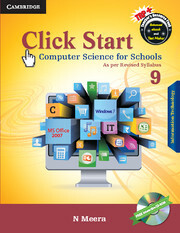 Click Start 9 is a Computer Science resource, covering the concepts of Windows 7, MS Office 2007, HTML, XML, programming languages C, C++ and Java. An interactive CD-ROM, with 3D animations, activities, games, exercises, printable worksheets and audio-visual learning modules catering to Windows 7 and MS Office 2007, is included. Teacher’s Notes provide creative suggestions to further strengthen learning and Teacher’s Manual to facilitate teaching. Snap Recap to reiterate the concepts learnt earlier. Learning Objectives to outline the objectives of the chapter. Fact Files to enhance the knowledge of the students. Quick Key and Try This to introduce shortcuts and alternative methodologies. Activities interspersed within each chapter to promote application based learning. Exercises to make tasks interactive and promote guided discussions and Application Based Questions to enhance problem solving skills of the students. Glossary and Now You Know to aid quick revision of the concepts learnt. Lab Work to encourage learning by doing and Updates on Windows 8 and MS Office 2010 to keep abreast with technology advancements.